Terence Hanley at Gem City Comic Con! Terence Hanley will be at the Gem City Comic Con in Dayton, Ohio, this weekend, Saturday, March 31 and Sunday, April 1, 2012. The convention takes place at the Student Union of Wright State University, 3640 Colonel Glenn Highway, Dayton, OH, 45435. You can find out more about the convention by clicking here. In other news, Five Star Comics #2 goes to print next week! Our sophomore effort will offer a showcase of Matt Marshall's talents with a full-color cover and a six-page story inside telling the origin of The New Black Bat! Missile returns in a new story by Larry Blake. Don't miss "The Trojan Cuckoo"! Gary Gibeaut revives not only Lady Luck, but also her sidekick and one of her enemies, Warped Brain! Tim Corrigan and Many Hands present a new kind of superhero--make that two superheroes--The Amalga-Mates in "The Case of the Nut Case"! Finally, Cave Girl returns, to face down a new menace in "Cave Girl and the Bat-King" by Terence Hanley! Five Star Comics #2, available April 2012! Terence Hanley at the Lexington Comic and Toy Convention! Five Star Comics creator Terence Hanley will be at the Lexington Comic and Toy Convention this weekend, Saturday, March 24, 2012. The convention will take place in the Heritage Hall East at the Lexington Convention Center, 430 West Vine Street, Lexington, KY 40507. The hours are 10 a.m. to 5 p.m. Check out the website of the convention here. In addition to his monsters and aliens coloring books, Terence will have Lucky Girl #1 and Five Star Comics #1 for sale. Look for sketch cards of your favorite characters as well, and if you don't find the one you're looking for, ask the artist! He can draw it for you! Isis, from the 1970s kid's show of the same name. 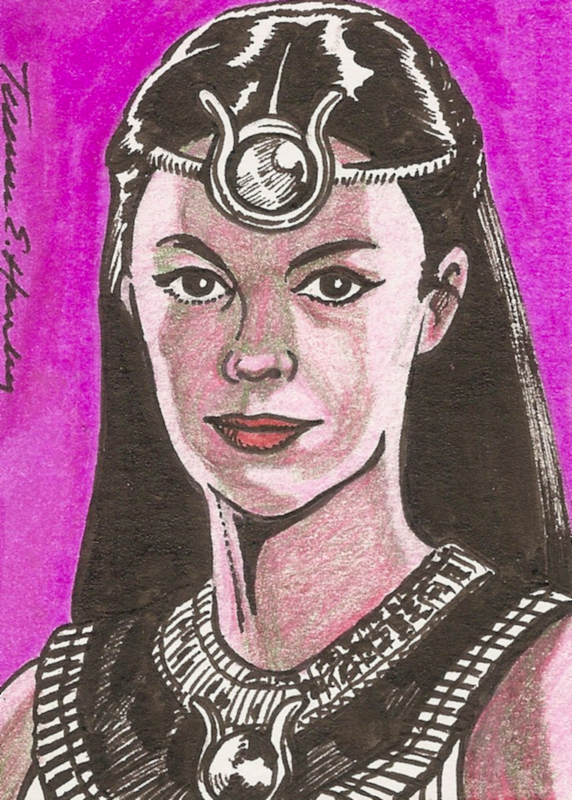 A sketch card by Terence Hanley. Five Star Comics #2 is nearing completion and if you liked the first issue, you'll love the second. 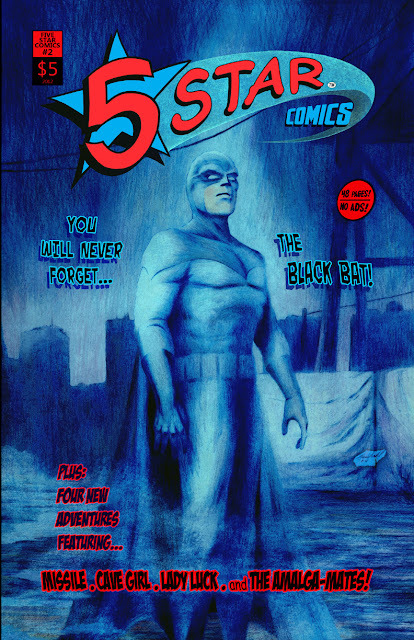 The Black Bat by Matt Marshall takes the lead spot in this issue. Matt's cover design will knock your socks off! Look for Five Star Comics #2 at the Small Press and Alternative Comics Expo (S.P.A.C.E. ), Saturday and Sunday, April 21 and 22, 2012, at the Ramada Plaza Hotel and Conference Center in Columbus, Ohio!